In ’74 Srila Prabhupad authored a document and gave emphasis TOPMOST URGENCY. The document was kept hidden for decades. Those Topmost Urgent instructions were never executed. ALL of SP’s Followers need to study this document & act to see that these instructions are finally carried out. In 1970 Srila Prabhupad wrote the Direction of Management – In 1974 He wrote amendments for ISKCON temples – that were never implemented – yet on the document is the emphasis ” TOPMOST URGENCY “, the most emphasis of any order he gave (that we know of) – To today that order has not been executed. 1.) It is declared that His Divine Grace A. C. Bhaktivedanta Swami Prabhupad is the Founder-Acharya of (ISKCON) International Society for Krishna Consciousness. He is the supreme authority in all matters of the society. His position cannot be occupied by anyone else, and his name and title must appear on all documents, letterheads, publications, and buildings of the Society. In particular it shall be clearly understood that no real estate may be purchased or sold by any officer of the Society without the express permission of His Divine Grace A. C. Bhaktivedanta Swami Prabhupad, the Founder-Acharya of ISKCON. 2.) 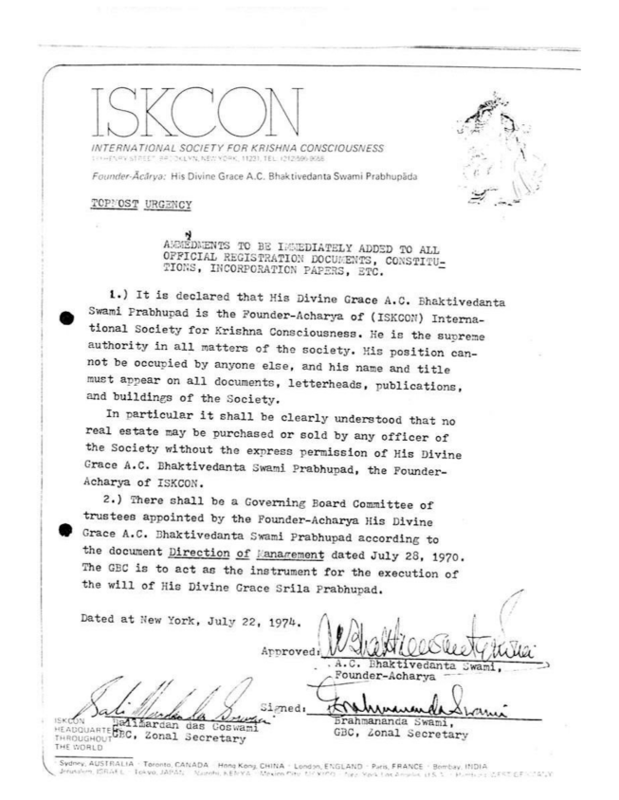 There shall be a Governing Board Committee of trustees appointed by the Founder-Acharya His Divine Grace A. C. Bhaktivedanta Swami Prabhupad according to the documentDirection of Management dated July 28, 1970 . The GBC is to act as the instrument for the execution of the will of His Divine Grace Srila Prabhupad. Dated at New York, July 22, 1974.